Whenever we film a marquee wedding at home and especially on a farm I always feel at home because that’s where I grew up a few years ago! The Ridout family made us welcome from the very first moment and the Ford family and all their friends were THE most friendly and hospitable crowd one could ever hope to meet. Absolutely LOVED the styling too. Pauline, the bride’s mum had done all the flowers with her sister and they were chic, elegant and totally beautiful. 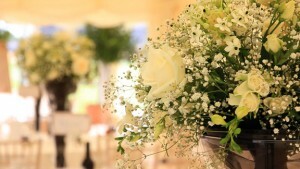 LOVED the flower buckets as wedding favours which Jo and family did themselves too. Lovely ceremony, great speeches - good joke on the ice bucket challenge guys - fabulous food, excellent band Radio Mary and oh so relaxed and welcoming hosts.Pauline had even colour schemed her garden to match the wedding and wow ... that is IMPRESSIVE!